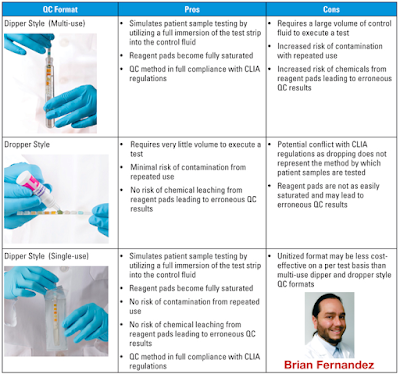 Urinalysis Quality Control at the Point-of-Care ! The goal of any clinical diagnostic test procedure is to provide critical information in a timely manner so that appropriate actions may be taken, ultimately improving patient outcomes. 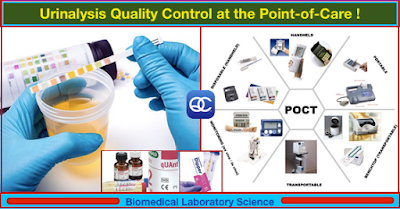 Point-of-care testing (POCT) is a term that has come to describe a multitude of rapid medical tests that can be performed at or near the site of patient care. The most compelling benefit of these tests is that, as opposed to having to wait hours or days for results to arrive from an outside laboratory, clinicians can obtain the results immediately, allowing for clinical management decisions to be made while the patient is still at the care facility. 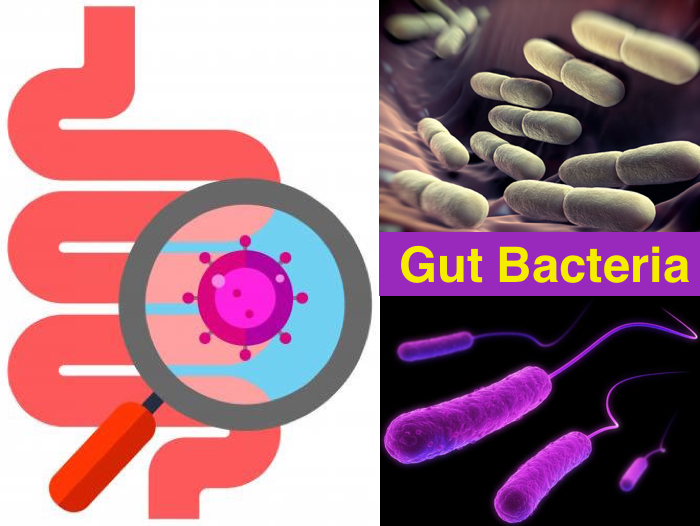 While the implementation of rapid diagnostic tests dates back to ancient history (sweet-tasting urine was once commonly used to diagnose diabetes mellitus), it was not until the 1950s that these rapid diagnostic methods gained any real predictive value. Today, the popularity and demand for POCT are increasing rapidly. 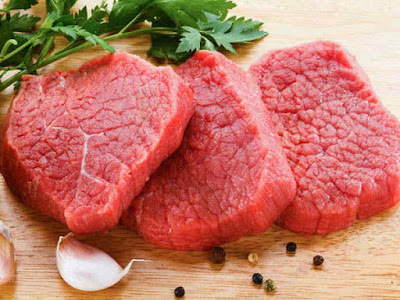 TriMark Publications estimates that the global market for POCT was $14.5 billion in 2016, and is expected to grow by seven percent over the next five years. Urinalysis using multi-analyte dipsticks is a point-of-care test performed at any hospital, clinical laboratory, doctor’s office, health clinic, and nursing facility. Various iterations of these tests have existed for decades, and they continue to be among the most commonly performed tests of any kind. Urinalysis dipsticks contain discrete reagent pads to semi-quantitatively test for the presence of bilirubin, blood, creatinine, glucose, ketones, leukocytes, nitrite, pH, protein, specific gravity, and urobilinogen in a urine sample. 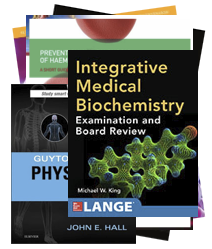 Practical Textbook of Biochemistry for Medical Students 2nd Edition ! 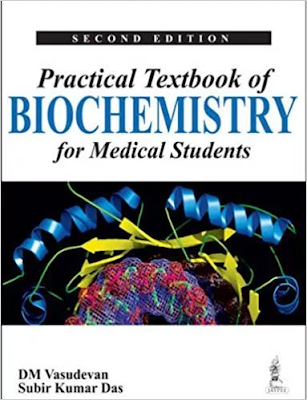 This book is in resonance with the Textbook of Biochemistry for Medical Students, by Vasudevan et al, which is now in the 7th edition. That textbook is now accepted not only inside India, but also various other countries in the world. The Spanish edition of the Textbook is already in market and a Russian edition is in preparation. Students are advised to clear the doubts by going through that main textbook. This practical book is prepared after consulting the syllabi of MBBS course of various universities. The contents are divided into qualitative and quantitative experiments, which the students are supposed to do by themselves in the practical classes. Further, a few more experiments are given, which may not be possible for the student to do by himself/herself. Some of these will be demonstrated in the practical classes. In the end, a few case reports are also included, which will be useful for the students to prepare the practical examinations. Read more: Gut Bacteria And The Brain: Are We Controlled By Microbes? 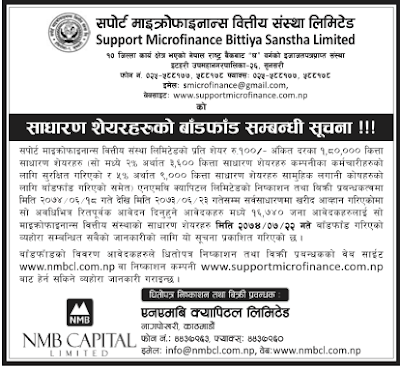 Support Microfinance Bittiya Sanstha Ltd. (SMFBL) has allocated its Initial Public Offering (IPO) today, Wednesday. 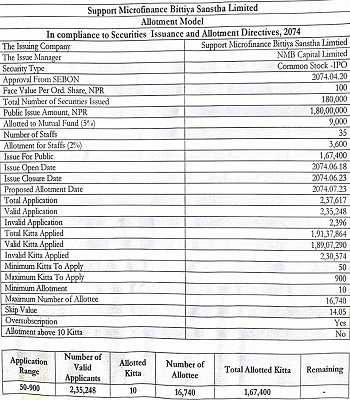 According to NMB Capital Ltd., the issue manager of the microfinance, out of 226,932 applicants, only 16,740 applicants are allotted 10 units of mandatory shares through the lottery system. Of the total 226,932 IPO share applications worthing Rs. 2.24 billion, 210,192 were canceled. 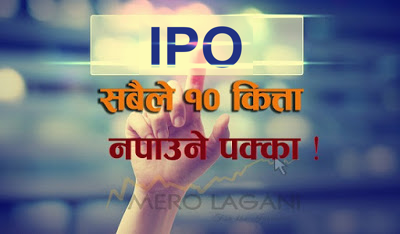 The microfinance headquartered at Itahari issued 180,000 units of IPO shares to general public worth Rs. 18 million from 4th to 9th October 2017. The issuance was oversubscribed by 27.69 times. Out of the total shares, the company allocated 3,600 units (2%) and 9000 units (5%) of shares for employees and mutual funds respectively. 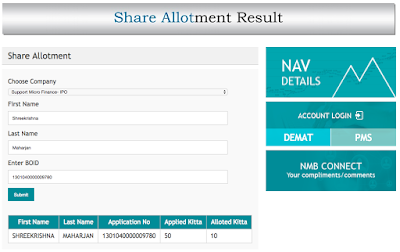 As per the statistics provided by NMB Capital, only 7.38% of the total applicants are provided the shares. Currently, the company has a paid-up capital of Rs. 42 million. 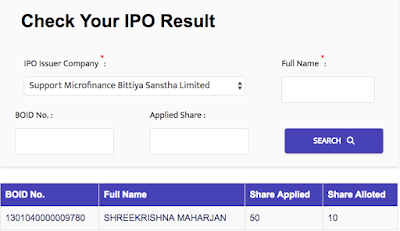 After this IPO issuance, it will reach Rs. 60 million. 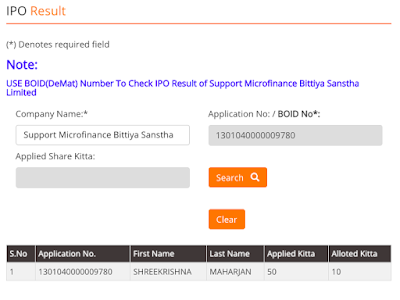 The microfinance earned a net profit of Rs. 4.8 million in the last Fiscal Year (FY). The company has Rs. 3.119 million in its reserve fund. 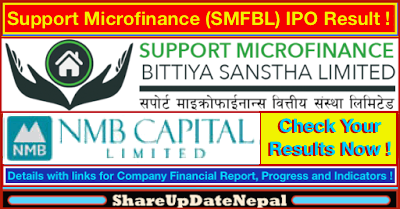 Labels: Allotment, Allottee List, BOID, Check Links, Full Name, Initial Public Offering, Invest, IPO, Nepse, NMB Capital Ltd., Result, Share Update Nepal, Shareholder, SMFBL, Support Microfinance Bittiya Sanstha Ltd.